Viknesh Vijayenthiran July 28, 2009 Comment Now! 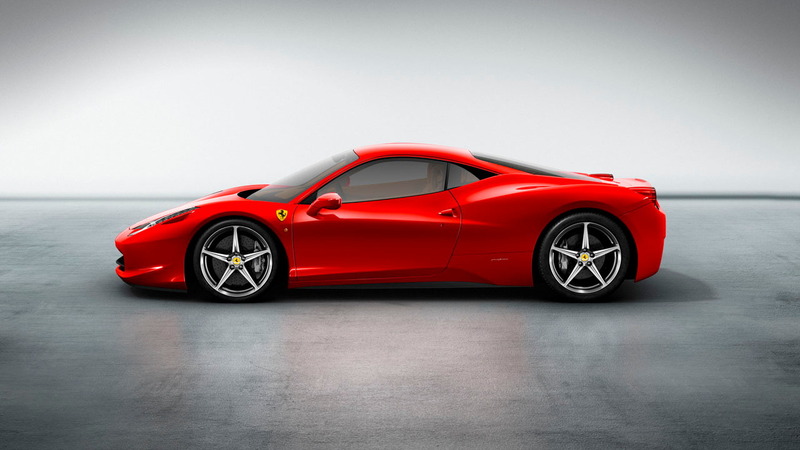 Ferrari has released the first details of its newest supercar, the Ferrari 458 Italia, which represents one of the largest leaps forward in technology, performance and emissions ever seen from the legendary Italian automaker. Its new 4.5-liter V8 engine produces 570hp (425kW) and 400lb-ft (540Nm) of torque, enough to blast the car to 62mph (100km/h) in less than 3.4 seconds and on to a 202mph (325km/h) top speed, yet it uses less fuel than the car it replaces – the already amazing F430. 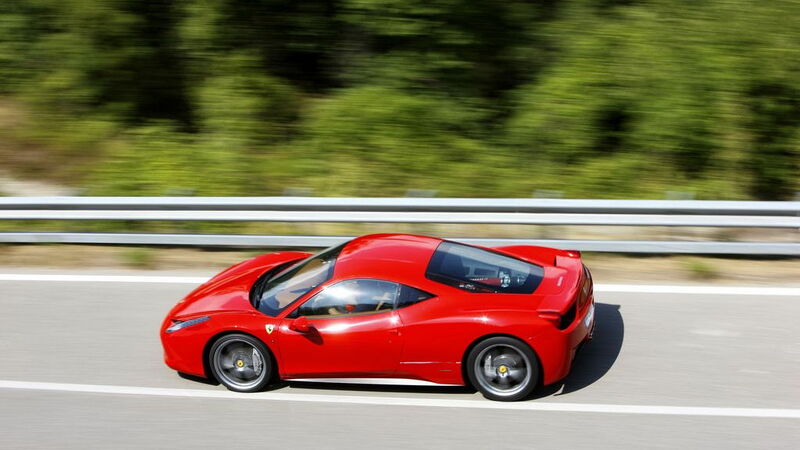 But these raw figures are just the start of the technological story of Ferrari’s newest model. While the outgoing F430 was largely based on the 360 Modena that preceded it, the Ferrari 458 Italia is a completely new car from every point of view: engine, design, aerodynamics, handling, instrumentation and ergonomics are all new. The car also benefits hugely from Ferrari’s F1 experience. This is particularly evident in the speed and precision with which it responds to driver inputs and in the attention focused on reducing internal friction in the engine for lower fuel consumption than the F430, despite the fact that both overall displacement and power have increased. The 458 Italia features an innovative driving environment with a new kind of steering wheel and dashboard that is the direct result of racing practice. Once again, input from Michael Schumacher - who was involved from the very start of the 458 Italia project - played a major part. The Ferrari 458 Italia’s Pininfarina design provides further evidence of the complete departure from the past that this new car hails. As with every Ferrari, the car’s styling has been very heavily influenced by the requirements for aerodynamic efficiency, as can be seen from the downforce of 140kg at 124mph (200km/h) generated by the new model. 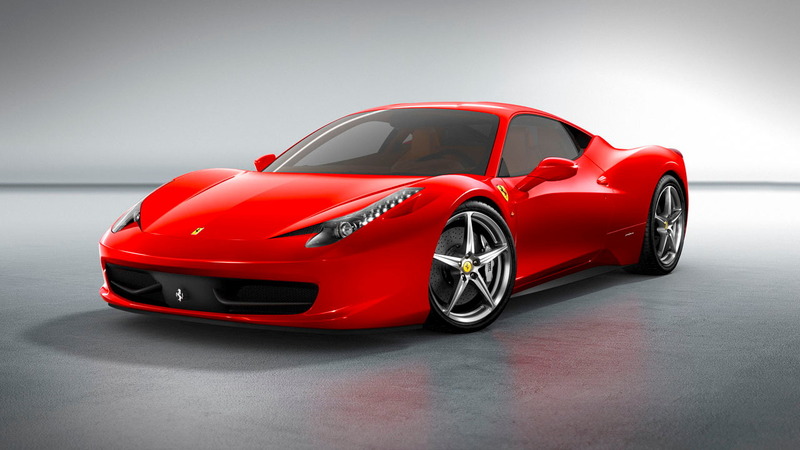 The new V8 is the first Ferrari direct injection engine to be mid-rear mounted. It has a very low piston compression height typical of racing engines that contributed to achieving its compression ratio of 12.5:1. Equipped with the traditional flat-plane crankshaft, the engine delivers its peak 570hp (425kW) at 9,000rpm and, with a power output of 126hp (94kW) per liter, sets a new benchmark not only for the whole Ferrari range and the history of company, but also for the entire market segment. Maximum torque is 400lb-ft (540Nm) at 6000 rpm, over 80% of which is available from 3,250 rpm. 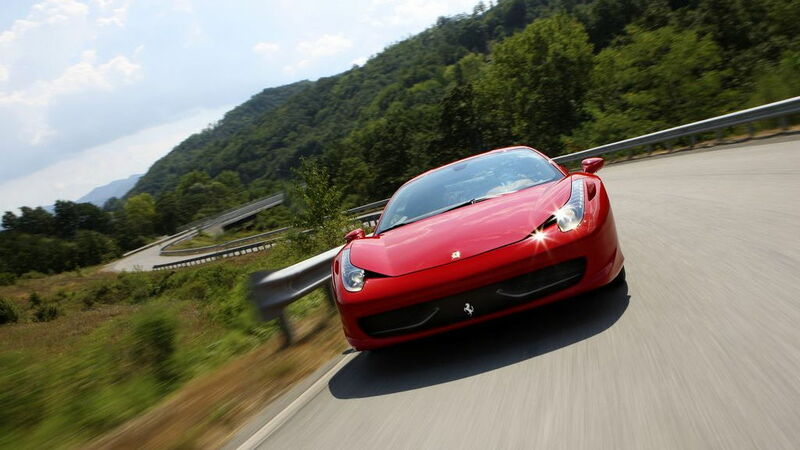 The 458 Italia is also equipped with a seven-speed dual-clutch transmission similar to the unit found in the California. According to Ferrari, the addition of a dual-clutch transmission plus direct injection technology helps lower the car’s CO2 emissions to 320g/km and fuel consumption to 13.7L/100km. A low kerb weight also helps here and Ferrari engineers have managed to keep the weight of the 458 Italia down to 1,380kg with a 42/58 front to rear weight distribution. Dimensions stand at 4,527mm in length, 1,937mm in width, and 1,213 in height. The wheelbase measures in at 2,650mm. 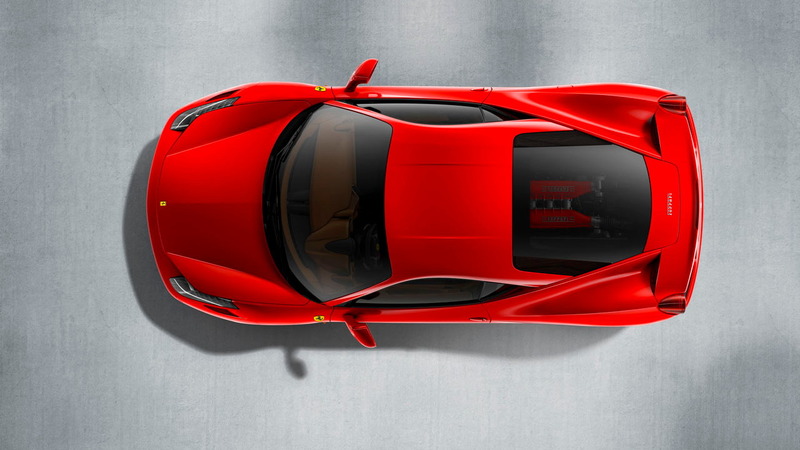 The Ferrari 458 Italia’s suspension features twin wishbones at the front and a multi-link set-up at the rear. Furthermore, the integration of the E-Diff and F1-Trac traction control systems (now controlled by the same ECU) and their respective mappings is even greater, resulting in a 32% increase in longitudinal acceleration out of corners compared to previous models. The same ECU also governs the ABS. The brakes also feature a prefill function whereby the pistons in the calipers move the pads into contact with the discs on lift off to minimize delay in the brakes being applied. This combined with the ABS has cut the 62-0mph braking distance to a mere 32.5m. Inside, the 458 Italia features a new interface where the main controls are all clustered on the steering wheel. Unfortunately, Ferrari is yet to reveal any other details for the interior. The new model will make its official world debut at this September’s Frankfurt Motor Show before going on sale in the first half of next year.